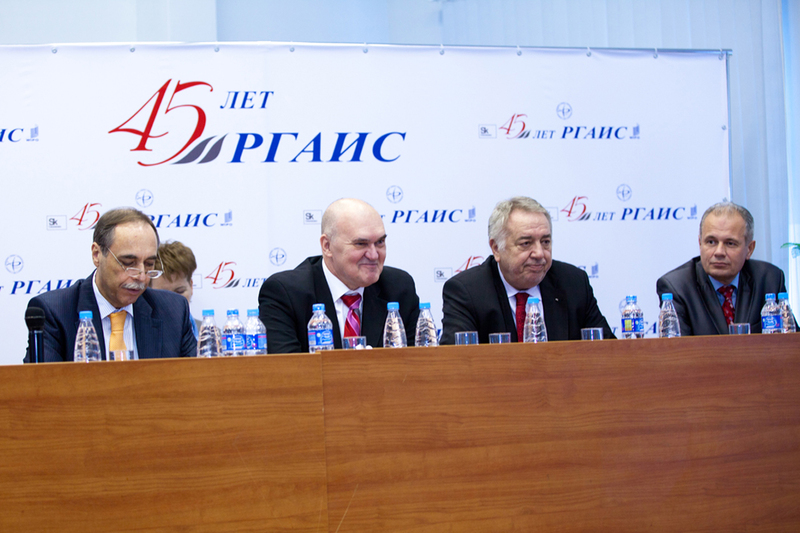 Since October, 29th, 2013 to November, 1st, 2013 at the Russian State Academy of Intellectual Property in Moscow has been organized a series of events related to the official celebration of the 45th Anniversary from the establishment of the Academy. many other representatives of the academic and professional circles in the field of intellectual property. 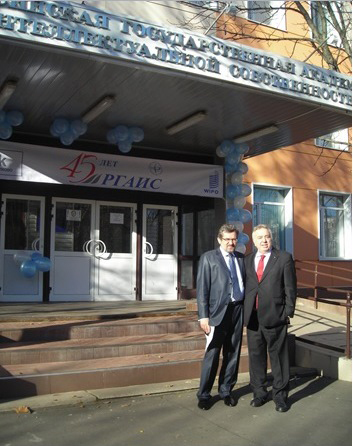 present and former lecturers, alumni of the Russian State Academy of Intellectual Property. In relation to the awarding the title of Honorary Professor (Doctor Honoris Causa) of the Russian State Academy of Intellectual Property to Prof. Dr. Borislav Borisov the special guest at the ceremony was His Excellency Boyko Kotsev, ambassador of the Republic of Bulgaria in Russia accompanied by a group of representatives of the Bulgarian diplomatic mission in Russia and the Bulgarian Industrial Center in Moscow. 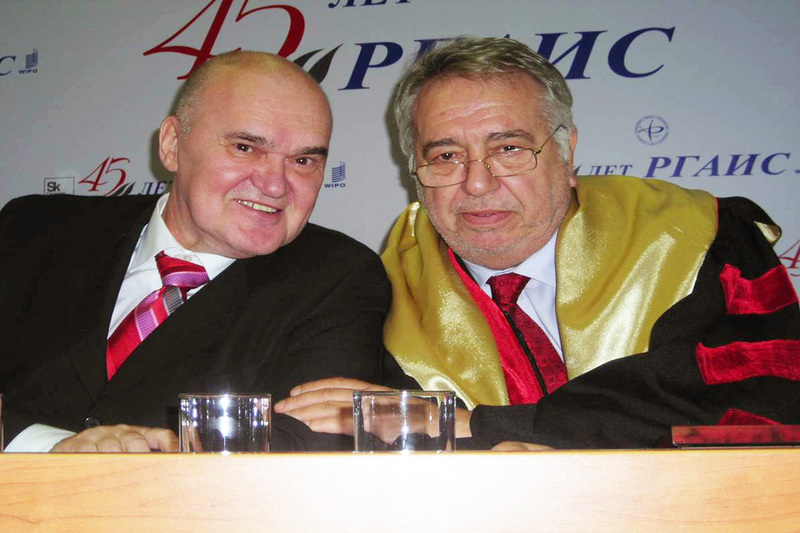 After the official speech by Prof. Bliznets devoted to the Anniversary it was started the ceremony on awarding the title of Honorary Professor (Doctor Honoris Causa) of the Russian State Academy of Intellectual Property to Prof. Dr. Borislav Borisov. 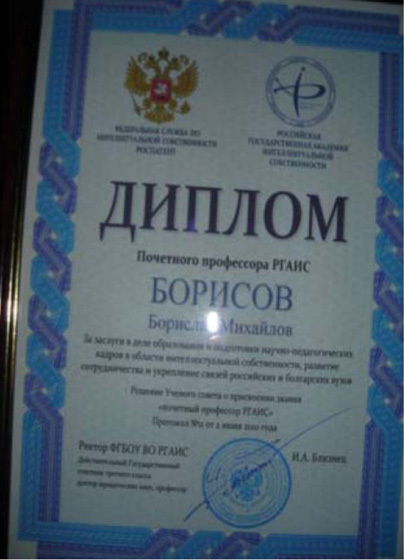 The Rector Prof. Bliznets presented the professional and scientific development of Prof. Borislav Borisov and read the Academic Council decision by which the title of Honorary Professor of the Russian State Academy of Intellectual Property had been conferred on him “for contribution to the education and preparation of scientific-pedagogical professionals in the field of intellectual property and for development of the cooperation between the Russian and the Bulgarian universities”. The Rector Prof. D.Sc. (Law) Ivan Bliznets is presenting the working and professional biography of Prof. Dr. Borislav Borisov. 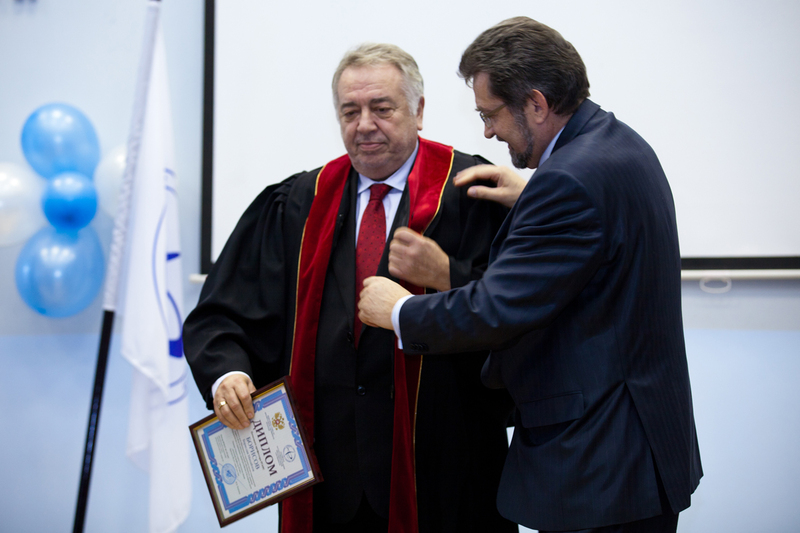 Prof. Bliznets bestowed on Prof. Borisov the Diploma of Honorary Professor of the Academy as well as the attributes related to it. 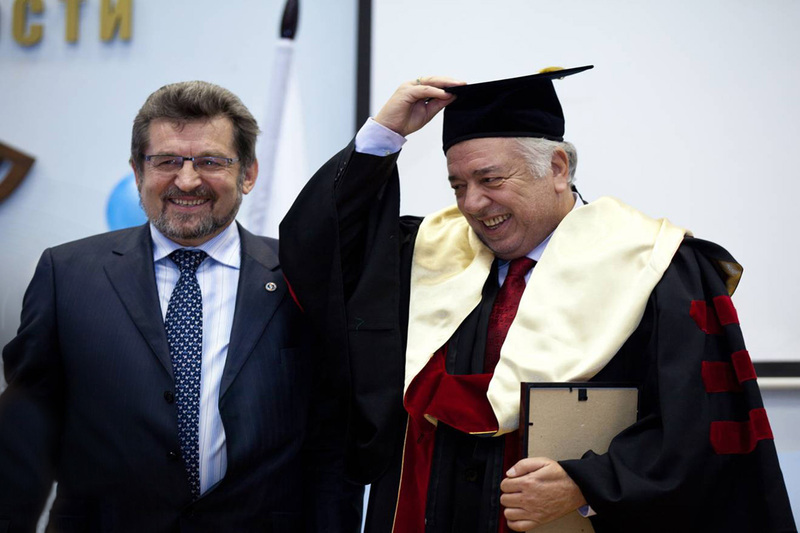 He outlined that the highest Honorary title of the Academy was conferred on Prof. Borisov immediately after in October 2013 the same title had been awarded also to Dr. Francis Gary, Director General of the World Intellectual Property Organization (WIPO). 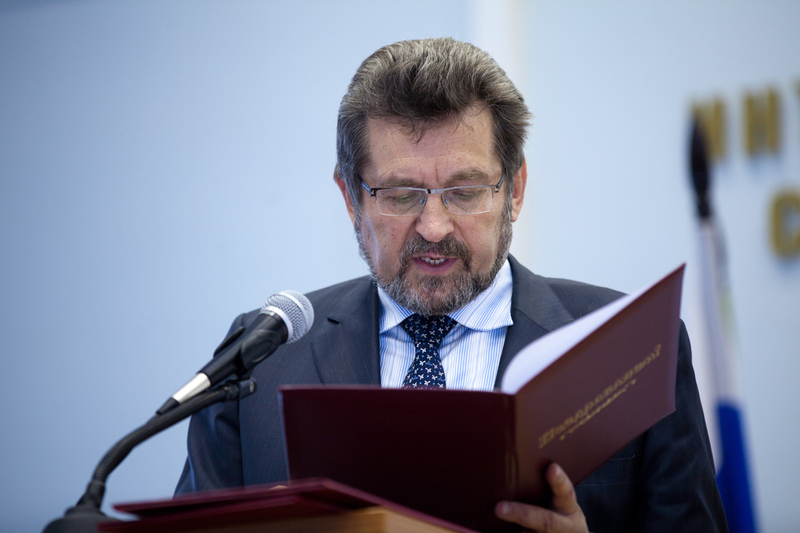 “We are especially pleased with the fact that 35 years ago Prof. Borisov has graduated from our Academy with excellent diploma and today he receives our highest reward for his uncontroversial and universally recognized merits in the development of education, research and business in the field of intellectual property”, outlined in his speech the Rector Prof. Bliznets. 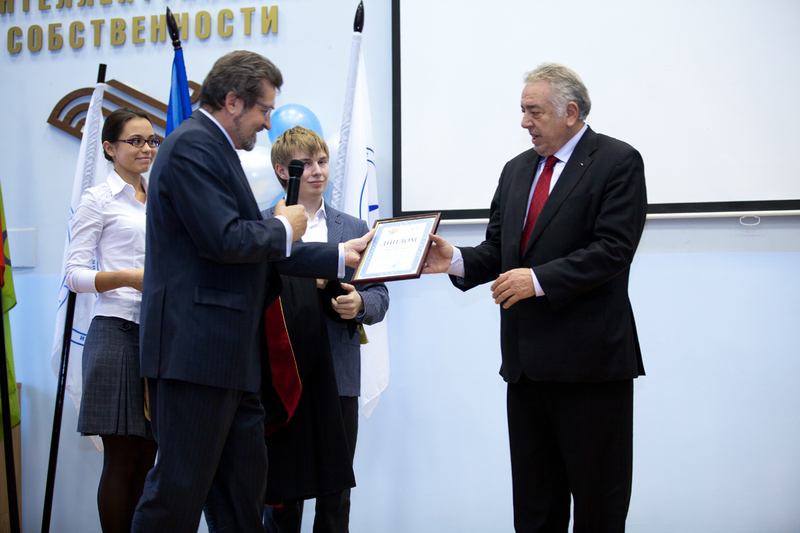 Prof. Borislav Borisov is already with all attributes of the Honorary Professor. 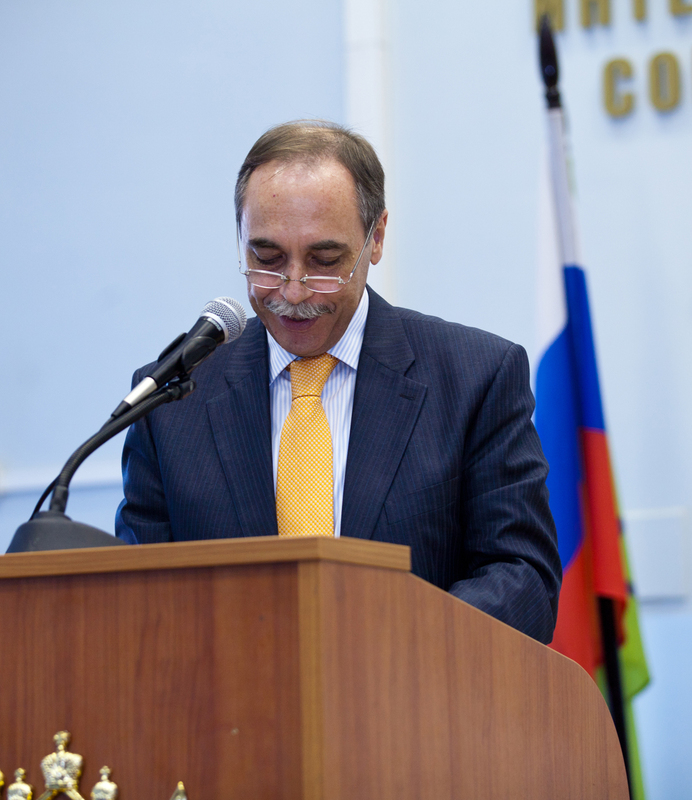 The academic speech of Prof. Borislav Borisov was devoted to his long professional road – since his moving in a long term regular course of education on Intellectual Property at the Russian Academy (at that time named Central Institute for Qualifications Improvement of Managers in Patent and Licensing Activity) to his rewarding by the title of Honorary Professor of the Russian State Academy of Intellectual Property today. “The knowledge acquired during my study in 1978/1979 was very useful in my work on the establishment of the Department and speciality on Intellectual Property as well as the Center and later the Intellectual Property and Leadership Institute at the UNWE. But the beginning of this long road for development of the educational and research structures on intellectual property at the universities in fact has begun from here, from this auditorium where I have studied and which is a ceremonial hall today where you award the title of Honorary Professor of the Academy to me. The circle has closed and I am professionally pleased with it!”, completed his academic speech Prof. Borislav Borisov which was followed by the tremendous and prolonged applause of the attendants who were rose to their feet at the hall. Prof. Dr. Borislav Borisov is delivering his academic speech. 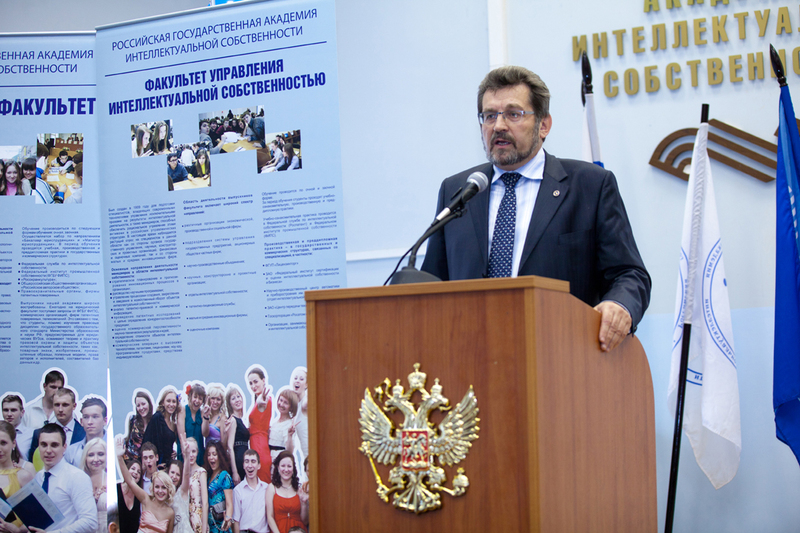 The first greetings to the new Honorary Professor of the Russian State Academy of Intellectual Property were extended by the Bulgarian ambassador in the Russian Federation His Excellency Boyko Kotsev. 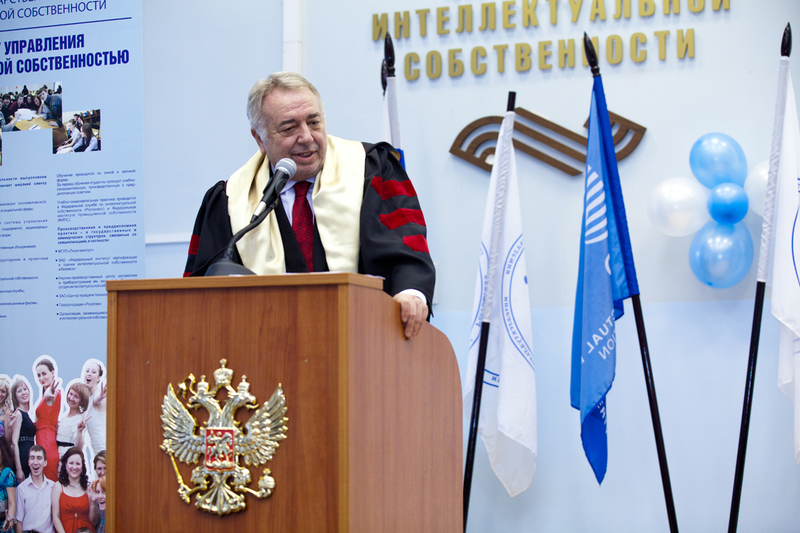 In his speech the ambassador Kotsev outlined: “The Academy graduates enjoy a well-deserved reputation in the world. One of them is also Prof. Borislav Borissov, respected by us, an authoritative Bulgarian scientist and founder of a research field in Bulgarian science, according to the words of Bulgarian President Georgi Parvanov (2002 – 2012) one of the "emblematic figures" in the foundation and development of the scientific field on intellectual property in our country”. “Bulgaria is proud of the fact that Prof. Borisov, one of both foreigners graduated from the Academy enjoys a well-deserved world recognition! Allow me to greet the Academy for this glorious jubilee as well as Prof. Borisov for the high and deserved reward!”, completed his greeting the ambassador Kotsev. Ambassador Boyko Kotsev is greeting Prof. Dr. Borislav Borisov for the Honorary title conferred on him. 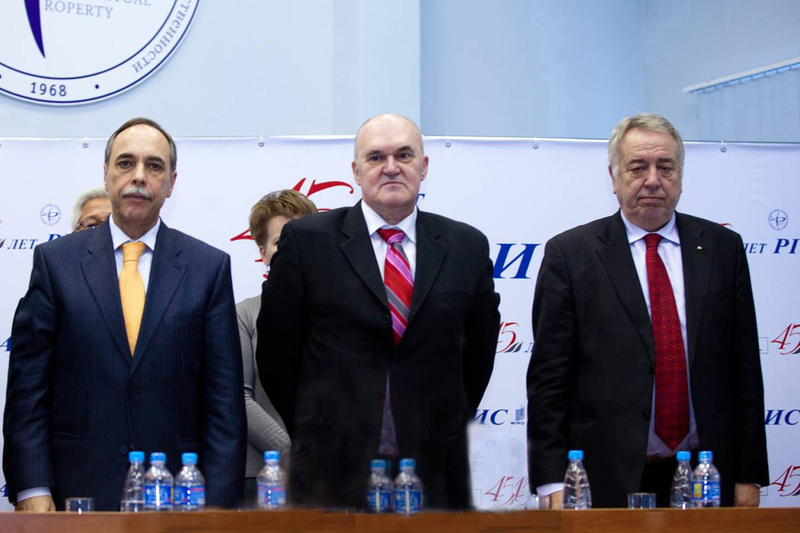 Greetings to Prof. Borislav Borisov were extended by Prof. Boris Simov, Chairman of the Russian Federal Service on Intellectual Property and by some of the other official guests at the ceremony. 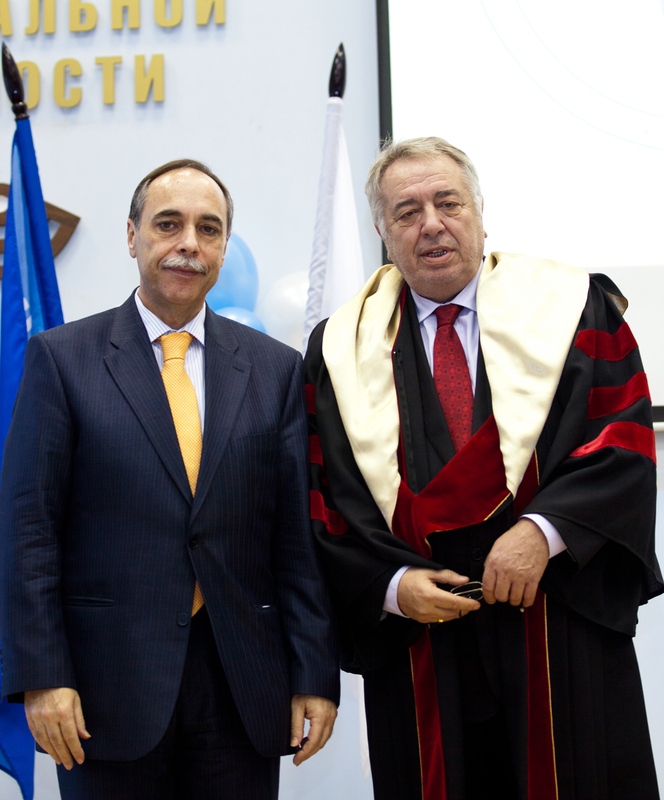 After the ceremony on his awarding by the Honorary title was finished, Prof. Borislav Borisov bestowed on the Rector of the Russian Academy Prof. Ivan Bliznets the Honorary mark of UNWE by which the Rector of the University of National and World Economy Prof. D.Sc. (Econ.) 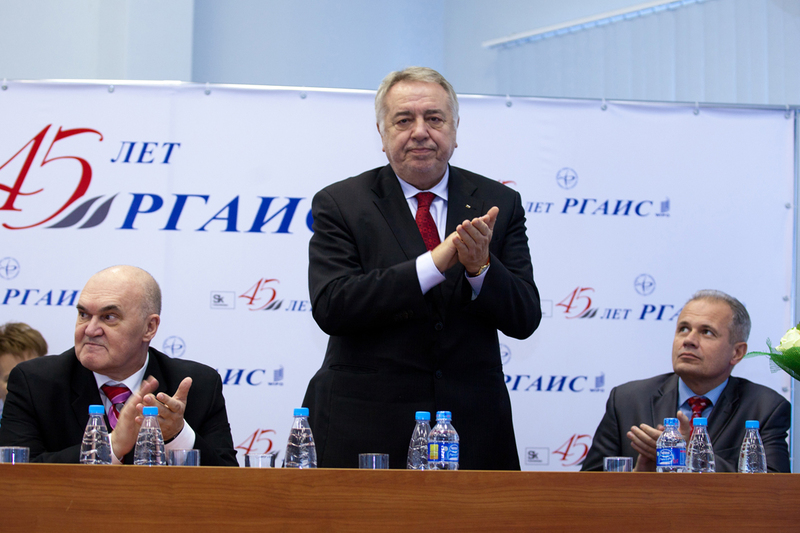 Statty Stattev honoured the Russian State Academy on Intellectual Property in relation to the 45th Anniversary of its establishment. 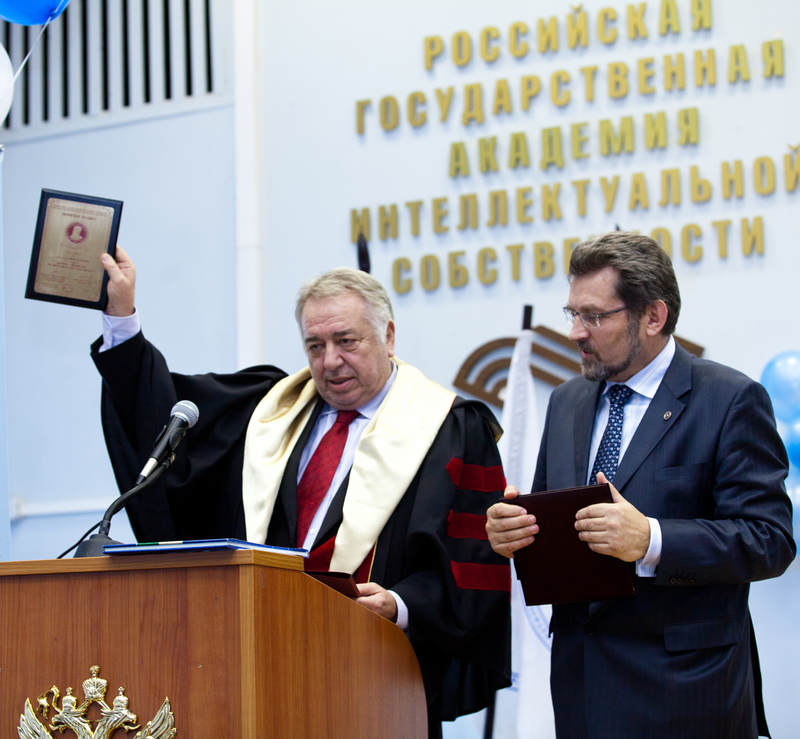 Prof. Borisov awarded the Honorary plaque to the Rector of the Russian Academy Prof. Ivan Bliznets on behalf of the Rector of UNWE Prof. D.Sc. (Econ.) Statty Stattev. On behalf of the Rector of UNWE Prof. D.Sc. (Econ.) 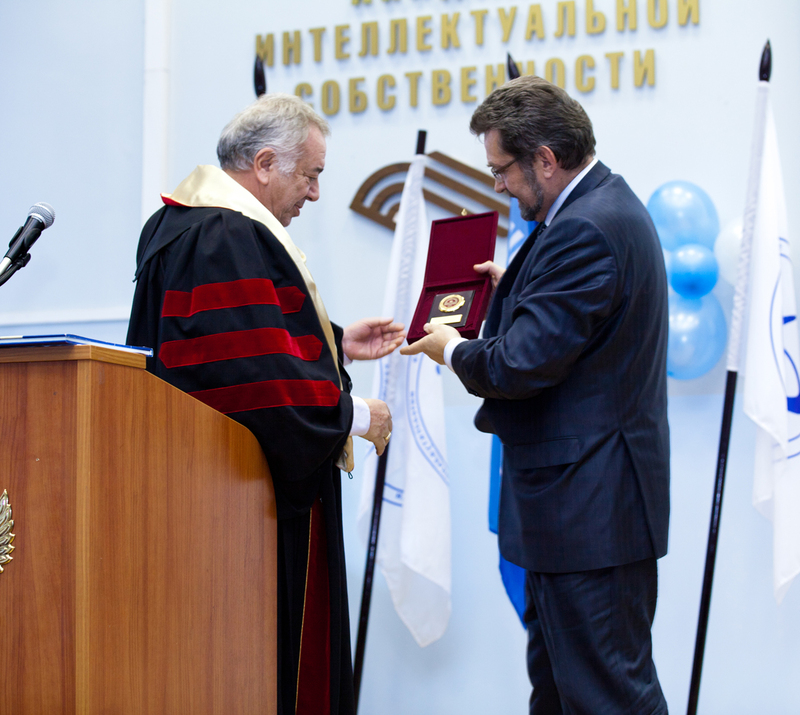 Statty Stattev, Prof. Borislav Borisov is awarding the Honorary mark of UNWE to the Russian State Academy of Intellectual Property and Honorary plaque to Prof. D.Sc. (Law) Ivan Bliznets, Rector of the Russian Academy. 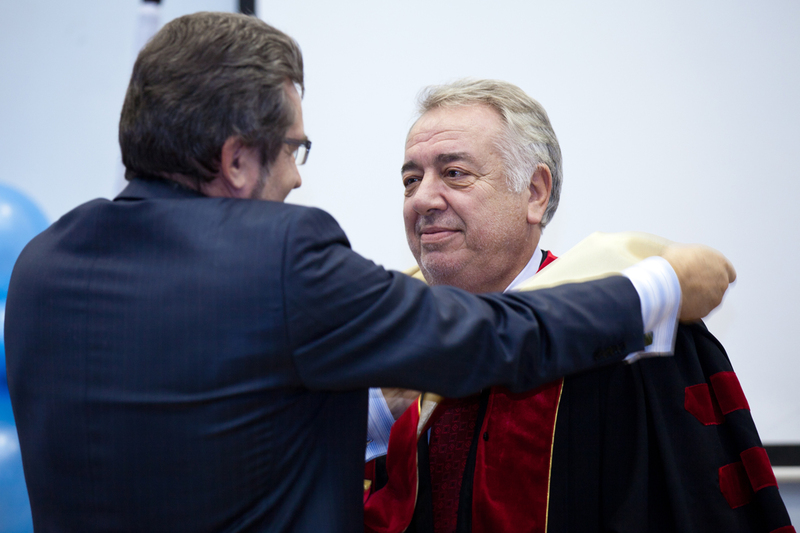 Congratulations to Prof. Borislav Borisov who was awarded the title of Honorary Professor / Doctor Honoris Causa of foreign university for the third time!